Replacement Ballast for the Coralife Turbo Twist 6X UV Sterilizer, 18W (NEW STYLE) that has been on the market since 2011. Replacement Fittings with Gaskets for the Coralife Turbo Twist 6X UV Sterilizer, 18W (NEW STYLE) that has been on the market since 2011. Coralife replacement Gasket Kit for the Coralife Turbo Twist 3X UV Sterilizer, 9W (NEW STYLE) that has been on the market since 2011. There are four gaskets in this Kit and five in the OLD STYLE. We also carry the OLD STYLE Gasket Kit. Coralife replacement Gasket Kit for the Coralife Turbo Twist 6X UV Sterilizer, 18W (NEW STYLE) that has been on the market since 2011. There are four gaskets in this Kit and five in the OLD STYLE. We also carry the OLD STYLE Gasket Kit. Coralife replacement Gasket Kit for the Coralife Turbo Twist 12X UV Sterilizer, 36W (NEW STYLE) that has been on the market since 2011. There are four gaskets in this Kit and five in the OLD STYLE. We also carry the OLD STYLE Gasket Kit. Coralife replacement Gasket Kit for the OLD STYLE 3X Turbo Twist UV Sterilizer. This part will not fit the Turbo-Twist we currently sell. It only works with the discontinued Turbo-Twist 3X Item # 77070 that was sold up through the Fall of 2011. 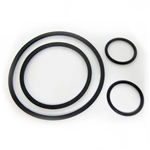 We also carry the Coralife Replacement Gasket Kit for the Coralife Turbo Twist 3X UV Sterilizer, 9W (NEW STYLE) that has been on the market since 2011. There are five gaskets in this Kit and four in the NEW STYLE. Coralife replacement Gasket Kit for the OLD STYLE 6X Turbo Twist UV Sterilizer. This part will not fit the Turbo-Twist we currently sell. It only works with the discontinued Turbo-Twist 6X Item # 77071 that was sold up through the Fall of 2011. We also carry the Coralife Replacement Gasket Kit for the Coralife Turbo Twist 6X UV Sterilizer, 18W (NEW STYLE) that has been on the market since 2011. There are five gaskets in this Kit and four in the NEW STYLE. Coralife replacement Gasket Kit for the OLD STYLE 12X Turbo Twist UV Sterilizer. This part will not fit the Turbo-Twist we currently sell. It only works with the discontinued Turbo-Twist 12X Item # 77072 that was sold up through the Fall of 2011. We also carry the Coralife Replacement Gasket Kit for the Coralife Turbo Twist 12X UV Sterilizer, 36W (NEW STYLE) that has been on the market since 2011. There are five gaskets in this Kit and four in the NEW STYLE. Coralife Turbo-Twist 12X UV Sterilizer, 36W (New Version) 1-1/4" Replacement Fitting (only ONE fitting). Also for the Turbo-Twist POND 12X UV Sterilizer, 36W (New Version). Coralife Turbo-Twist 3X UV Sterilizer, 9W (New Version) Replacement C Bracket . Also for the Turbo-Twist POND 3X UV Sterilizer, 9W (New Version). This will NOT work with the older versions of the Turbo-Twist. Coralife Turbo-Twist 6X UV Sterilizer, 18W (New Version) Replacement C Bracket . Also for the Turbo-Twist POND 6X UV Sterilizer, 18W (New Version). This will NOT work with the older versions of the Turbo-Twist.